Good Condition. The text has some marking, the first 30 pages have light waviness from a liquid spill on the outer edges. The cover has wear with creases and light waviness. STUDY GUIDE Quantity Available: 1. Category: Economics; ISBN: 0324174616. ISBN/EAN: 9780324174618. Pictures of this item not already displayed here available upon request. Inventory No: 1560798810. Very Good Condition. Text has highlighting, Cover has slight wear. STUDY GUIDE Quantity Available: 1. Category: Economics; ISBN: 0324174616. ISBN/EAN: 9780324174618. Pictures of this item not already displayed here available upon request. Inventory No: 1560780831. Very Good Condition. The text appears clean, has a crease on the lower front corner. STUDY GUIDE Quantity Available: 1. Shipped Weight: Under 1 kilo. Category: Economics; ISBN: 0324174616. ISBN/EAN: 9780324174618. Pictures of this item not already displayed here available upon request. Inventory No: 1560798809. Very Good Condition. Text has highlighting, Cover has slight wear. STUDY GUIDE Quantity Available: 1. 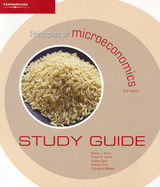 Category: Economics; ISBN: 0324174616. ISBN/EAN: 9780324174618. Pictures of this item not already displayed here available upon request. Inventory No: 1560740093. As New. New, Clean Text, Cover has minor wear curl. STUDY GUIDE Multiple copies available this title. Quantity Available: 2. Category: Economics; ISBN: 0324174616. ISBN/EAN: 9780324174618. Pictures of this item not already displayed here available upon request. Inventory No: 1560740094. As New. As new STUDY GUIDE Multiple copies available this title. Quantity Available: 6. Shipped Weight: Under 1 kilo. Category: Economics; ISBN: 0324174616. ISBN/EAN: 9780324174618. Pictures of this item not already displayed here available upon request. Inventory No: 1560740863. Good. [ No Hassle 30 Day Returns ][ Underlining/Highlighting: SOME ] [ Writing: SOME ] [ Edition: third ] Publisher: South-Western Pub Date: 2/1/2003 Binding: Paperback Pages: 438.